I was honored to recognize the Level 9 World Xtreme State Champions on March 24th. The Georgia General Assembly reconvened under the Gold Dome on Monday, March 20 for day 36 of the 2017 legislative session. With sine less than a week away, the House had another busy week of reviewing legislation in committee hearings, voting on bills and resolutions on the House floor and giving final passage to several bills that will now be considered by Governor Deal. In these remaining days and weeks of the session, one might assume that our Capitol business is winding down, but on the contrary, we have especially ramped up our House efforts to perfect legislation before the 2017 session comes to an end. Hearing loss is one of the most prevalent defects in children from birth to age three, and early intervention is critical for these children, as oftentimes hearing loss can result in speech and literacy deficiencies. The House overwhelmingly passed Senate Bill 206, also known as the Hearing Aid Coverage for Children Act, a bipartisan measure that would provide hearing aids to children in Georgia. This bill would require that health insurance plans in Georgia cover the cost of hearing aids for children 18-years-old and under who have been diagnosed with hearing loss. Hearing aid coverage would be limited to $3,000 per hearing aid, and insurers would be required to repair or replace one hearing aid per hearing impaired ear every 48 months for those who are covered. Insurance plans would cover all medically necessary services and supplies, including the initial hearing aid evaluation and all follow up appointments. The bill clarifies that these requirements would not prohibit a health benefit plan from providing more generous coverage to an insured individual, nor can a health benefit policy deny coverage to an individual because he or she was previously diagnosed with hearing loss. It will provide deserving children in Georgia with hearing aids and allow children with hearing loss to lead an unaffected life. Instruct the Department of Veterans Service to create and maintain a women veterans’ office to better serve Georgia’s nearly 100,000 female veterans. This office would conduct outreach to female veterans to inform them of federal and state veterans’ benefits and services eligibility, as well as assess the specific needs of women veterans regarding benefits and services. The office would also review programs, research projects and other initiatives designed specifically to aid Georgia’s women veterans, with a focus on issues such as child care and military sexual trauma. The office would also recruit and train women veterans to serve as mentors for those participating in a veterans’ court division, which provides an alternative to the traditional judicial system for cases involving a veteran defendant. Another military-friendly measure that passed this week was House Resolution 462. HR 462 was adopted unanimously and further confirms the House’s commitment to strengthening Georgia’s military installations and supporting our troops, their families and our veterans. House Resolution 462 reaffirms the House’s dedication to our military personnel by signaling that the House would take all actions it deems appropriate to improve their quality of life, empower them to contribute to our nation’s defenses and maximize the value of our military installations. HR 462 reiterates the House’s sincere desire that the State of Georgia remains integral to our national defense. We are proud to support our armed forces, and by reaffirming our commitment to the military and adopting HR 462, we are sure to continue this trend of passing military-friendly legislation into the future. Georgia has the fifth largest military population in the country, and with an annual impact of $20 billion, our military is one of our state’s biggest economic drivers. The Department of Defense directly employs almost 150,000 Georgians and is indirectly responsible for an estimated 330,000 additional jobs in the state. Our state is home to approximately 750,000 veterans, making Georgia state the eighth largest state in terms of veteran population in the nation. Throughout his time in office, Governor Deal has made it his mission to transform Georgia’s criminal justice system, giving offenders a second chance, saving taxpayers money and enhancing public safety in Georgia. To further expand upon these reforms, the House overwhelmingly passed three criminal justice reform bills this week: Senate Bill 174, Senate Bill 175 and Senate Bill 176. These landmark criminal justice reforms have been nationally recognized and emulated in other states across the country, and these measures will continue to build upon Governor Deal’s efforts in promoting rehabilitation and productive citizenry and enhance Georgia’s already remarkable criminal justice reform legacy. SB 174 would allow the Council of Accountability Court Judges to establish a peer review and certification process to guarantee that veteran court divisions are following the council’s standards and are adhering to the same policies, procedures and standards of other accountability courts in Georgia. SB 174 would allow the Board of Community Supervision to offer educational, skills-based programs for probationers to encourage employment and successful reentry into society. SB 174 would give judges the ability to require fines, fees or restitution payments as a probation condition with the option to waive the payment if the court finds a significant hardship. SB 175 would allow juvenile court judges to issue parental compliance orders in cases involving a delinquent child in order to promote the child’s rehabilitation and welfare and encourage parental involvement. SB 175 would expand a court’s options when determining how to proceed in cases involving a child that has been deemed incompetent but has committed a crime. Under SB 175, a court would be allowed to temporarily detain juveniles who pose a threat to public safety. SB 176 would offer a lower cost alternative to arrest and incarceration when an individual fails to appear in court for a non-serious traffic violation. Under SB 176, an individual who commits a minor traffic violation would be issued a traffic citation, and the officer would then release the individual for further appearance before the proper judicial officer. If the individual fails to appear for court, the court would notify the accused a second time by mail before issuing a bench warrant, giving the individual 30 days to dispose of the charge or waive arraign and plead not guilty. Each legislative session, the General Assembly is constitutionally required to pass a balanced state budget, and this week both the House and Senate gave final approval to House Bill 44, the Fiscal Year 2018 state budget. The FY 2018 budget guides all state spending from July 1, 2017, to June 30, 2018, and the final version of HB 44 resulted from the collaborative efforts of a conference committee made up of House and Senate members. HB 44 was set by a revenue estimate of $24.9 billion, a $1.25 billion increase from the original 2017 state budget, and addresses some of our state’s critical needs and moves our state forward for our citizens. HB 44 focuses on our state’s most vulnerable citizens and includes funding for many of the House’s top priorities, such as child welfare, military communities and services members and rural communities. HB 44 supports our military population by providing funds for additional school counselors in school systems with large military student populations, additional scholarships for Georgia National Guard members and additional veterans support positions. HB 44 is a win for each one of Georgia’s 10 million plus citizens and is sure to have long term, positive impacts on our state. The FY 2018 budget now heads to Governor Deal’s desk for his final approval. March 24th marked legislative day 38. My fellow House members and I will now be quickly and efficiently reviewing and passing quality legislation to send to Governor Deal. During this last week of the 2017 legislative session, it is especially important to me that I consider your opinions and understand your concerns, so please do not hesitate to contact me to express your thoughts on any pending House or Senate legislation. 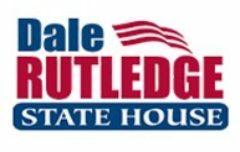 My Capitol phone number is 404.656.0254 and my email address is dale.rutledge@house.ga.gov. As always, I am honored to serve as your representative.